It wasn't too hard to find pieces of fabric in my stash for the spool centers and caps, but when it comes to strips, borders, backing, and binding, my options were much more limited. I need 1 1/2 to 4 yards for each of these components, which narrows the field quite a bit! I am thinking of using the white with purple polka dots for the backing, the pinwheels (another Anna Maria fabric) for the borders, the purple with white polka dots for the strips, and the bright yellow floral for the binding. The one I am not so sure about is the binding... the others I love. Another idea is to do a scrap stripped binding, but that is something new for me. Might be the time to try it! Yay! You must be getting close if it's time to pick out those pieces. 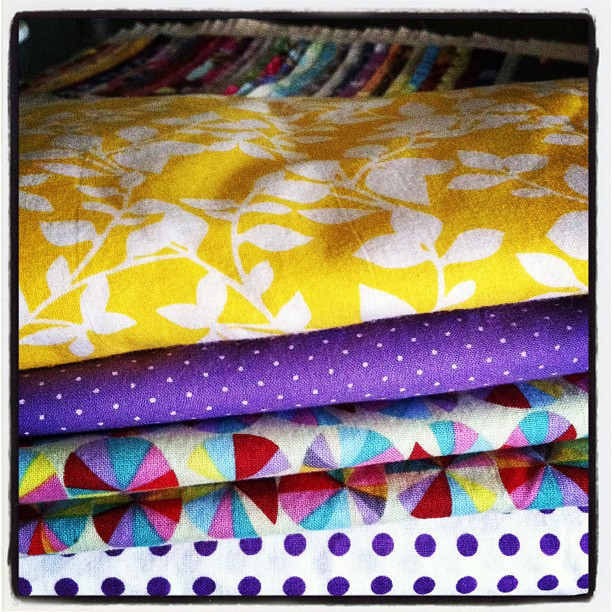 It's going to be such a colorful, beautiful quilt! I hope so! I did not get much done this weekend so I am hoping to make up for it today!